It’s often said that truth is the first casualty of war, and it seems that’s also the case with the way the EU referendum is going so far. Facts, stats and data are flying about all over the place from all sides, and it’s not surprising that many people are confused. Well, of course, as an independent journalist I have been trying my best to post factual articles to counter the mistruths about Britain’s membership of the EU. But with few resources and working on my own, there is a limit to what I can achieve. Now, however, a new website has launched that I can highly recommend. 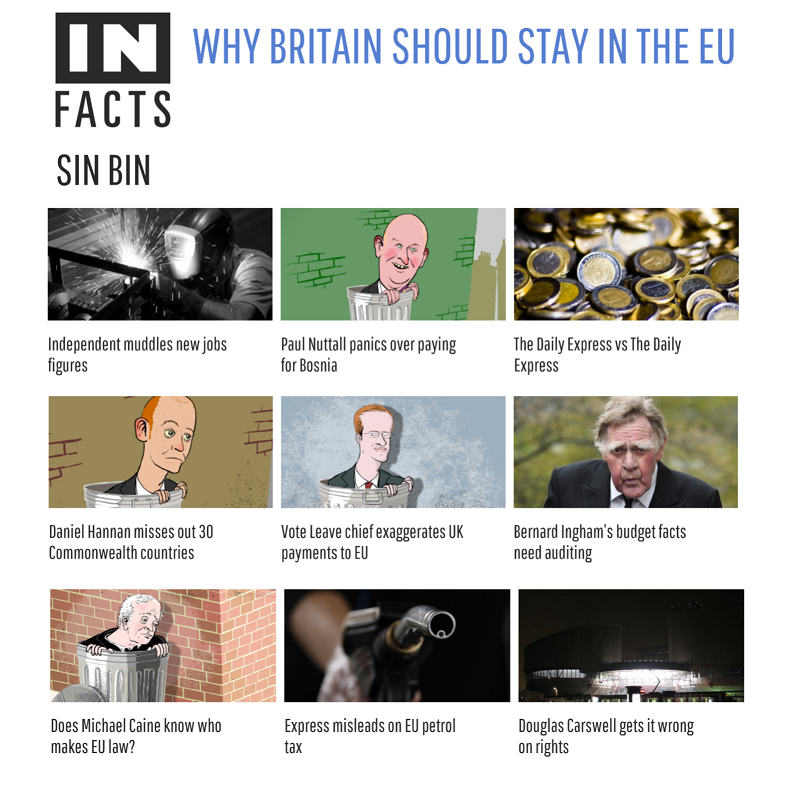 It’s called InFacts.org and it’s doing a sterling service in combating some of the blatantly incorrect information being published and broadcast about the European Union. It has, for example, a section called ‘Sin Bin’ where every day it takes to task statements proclaimed by newspapers and politicians that are provably wrong. Hopefully this will be helpful to all those who, like me, support Britain’s continued membership of the EU, and need ready-facts at the breakfast or dinner table when discussing with friends and family whether Britain should stay in the EU. And it seems that, in the lead-up to the EU referendum, such meal-time, pub-time and work-time discussions are going to become more and more prevalent and likely quite heated too. In the latest edition of Infact’s ‘Sin Bin’, The Independent is taken to task for falsely reporting that, since 2010, one-third of new jobs were taken by foreigners. Tory MEP and ardent Eurosceptic, Daniel Hannan, is challenged for wrongly stating that the EU only has trade-deals with two Commonwealth countries. Vote.Leave boss, Matthew Elliot, is pulled up for erroneously claiming that the UK sends almost £20 billion a year to the EU. Does the fact that I am promoting ‘In Facts’ make me biased as a journalist? Yes, it does. I am openly pro-EU and happy to declare that as ‘an interest’. However, that doesn’t mean I don’t also have a healthy respect for the truth. As I have often written, I accept the truth, and don’t argue with it, whether I like it or not. After all, my reputation as a journalist of many years standing is based on being a truthful and honest reporter of facts. 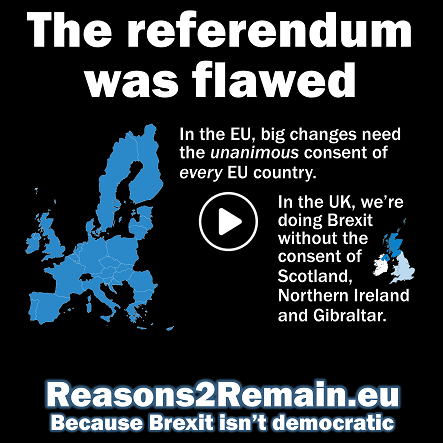 So, if the Leave campaign do come up with better information and verifiable evidence that Britain should end its membership of the EU, then yes, my mind is open to change. So far, however, they haven’t managed to persuade me. Sure, there is a lot wrong with the EU. However, my view is that the EU isn’t bad enough, and the alternatives aren’t good enough, for Britain to leave. 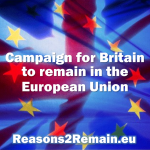 So, consequently, I intend to vote for Britain to ‘Remain’ in the EU. 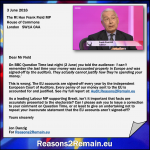 This entry was posted in Current Affairs, Democracy & Citizenship, Economics & Trade, Education, Energy & Climate Change, Law & Justice, Media & Communications, Politics & Public Policy, Science & Technology, Society & Culture, Teaching & Learning, The EU and tagged 23 June 2016, Bernard Ingham, brexit, Daniel Hannan, EU referendum, European Union, InFacts, InFacts.org, sIn bin. Bookmark the permalink. Listening to two cabinet ministers trying to explain why they are supporting Britain remaining in the EU this morning was excruciating. Apart from parroting ‘stronger, safer, richer’ both suggested that although the EU was deeply irritating, inefficient and prevented them from doing the job they were promoted to, they couldnt imagine the alternative was better. Compared to Gove’s statement on his reasons for endorsing Brexit, it was like night and day. 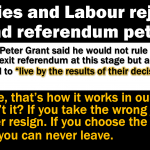 The Remain campaign will need to make considerably better reasons for staying, talking about a step into the dark is not a reason to stay. Thanks for the link though, do you consider them an independent source? Roy Jacobs, you are once again posting personal attacks against me which are not allowed here. If you persist in doing that, you will not be welcome to post here again. For crying out loud Jon, how on earth can you interpret this as a personal attack against you!? Apart from asking whether you considered the source independent I didn’t mention you. I understand your house rules on this blog, I am trying very hard to keep within your boundaries, mostly though not always we disagree, you have suggested you welcome a difference of views, I am providing that. Seriously, what is the problem? •	Firstly let me state from the beginning I love Europe. Europe is a wonderful place full of amazing country’s with incredible culture and brilliant people. I welcome migrants, they have been a huge benefit to our country, done amazing things and continue to contribute hugely to Britain every day. •	So why am I voting to leave? ……. •	Being in the EU is making me be less pro Europe every day. The decisions that we cannot deport a man we feel as a country is a threat to our stability, makes me like Europe less. When they tell us that our prisoners have to have a vote when as a nation we don’t want that. That is when we fall out of love with Europe, when a justice from another nation imposes laws that we do not want. •	The EU has an agenda and it will not slow down for our nation or any nation. I want to be a part of it but I feel we need to go at our own rate and not be directed or dictated against our nations will. We are a long way from being one nation with Europe. 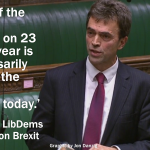 •	Exit from will give us the opportunity to protect our justice system, fisheries, border control, farming subsidies, and so many other aspects that we currently cannot protect to the manner we like.